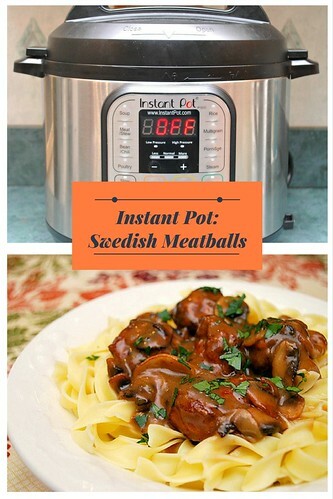 Making Swedish Meatballs at home is easier than you may think... and you'll save yourself some preservatives and money in the process. The meatballs are definitely the star of the dish and it's distinct flavor comes from the use of spices like nutmeg and allspice. A touch of sweetness is added with a little brown sugar too. The interesting part of this recipe is having your stand mixer do all the work. If you don't have a stand mixer, no worries - just mix everything by hand. However the stand mixer does a great job combining the ground pork with the spices along with mixture of torn bread soaked in milk, some baking powder for leavening and ground beef. Using a scoop to form the meatballs makes it easier for size consistency. The original recipe calls for frying the meatballs but in an effort to save time and energy (and calories!) I baked the meatballs instead. For additional flavor, I made the gravy with some caramelized mushrooms and omitted the addition of cream. 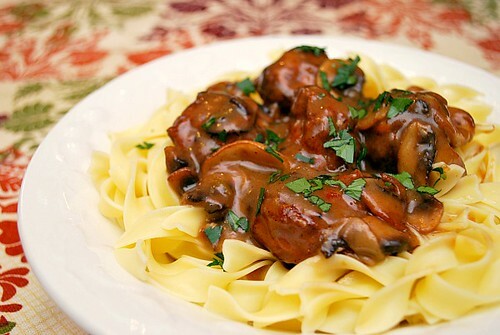 I thought the gravy was rich and flavorful this way and it really made the dish even more comforting! 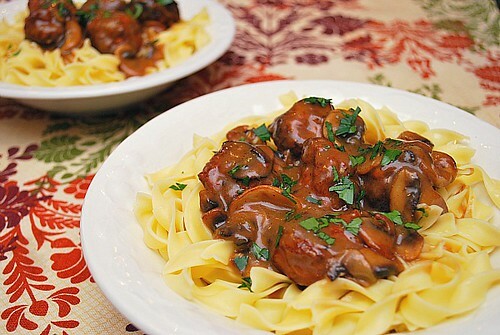 This is a great dish when you're looking for something other than the usual tomato based sauce and pasta. Yum! Whisk egg and cream together in medium bowl. Stir in bread and set aside. Meanwhile, in stand mixer fitted with paddle attachment, beat pork, onion, nutmeg, allspice, pepper, brown sugar, salt, and baking powder on high speed until smooth and pale, about 2 minutes, scraping bowl as necessary. Using fork, mash bread mixture until no large dry bread chunks remain; add mixture to mixer bowl and beat on high speed until smooth and homogeneous, about 1 minute, scraping bowl as necessary. Add beef and mix on medium-low speed until just incorporated, about 30 seconds, scraping bowl as necessary. Using a small or medium ice cream scoop, form meatballs with wet hands and set aside; repeat with remaining mixture to form 25 to 30 meatballs. Heat oil in 10-inch straight-sided sauté pan over medium-high heat until edge of meatball dipped in oil sizzles (oil should register 350 degrees on instant-read thermometer), 3 to 5 minutes. Add meatballs in single layer and fry, flipping once halfway through cooking, until lightly browned all over and cooked through, 7 to 10 minutes. (Adjust heat as needed to keep oil sizzling but not smoking.) Using slotted spoon, transfer browned meatballs to paper towel-lined plate. Tip: rather than frying your meatballs, use a mini muffin pan and bake them instead! 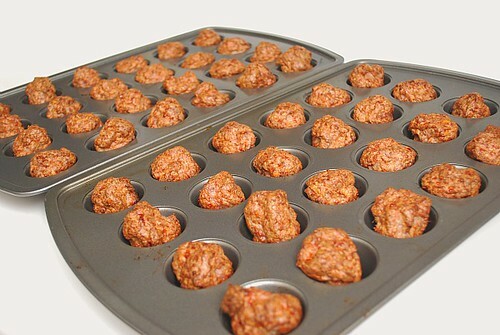 Spray the mini muffin pan with cooking spray to prevent sticking and place your meatballs in each well. Bake at 350 degrees for 15-20 minutes. Remove and use in the recipe as directed. Press SAUTE and add butter. When foaming subsides, add flour and cook, whisking constantly, until flour is light brown, about 30 seconds. Slowly whisk in broth. When the IP beeps after pressure cooking for 5 minutes, allow your IP to naturally release pressure for 5 minutes. While naturally releasing pressure (also known as NPR or NR), the display will reflect numbers counting up from 1. The numbers indicate how many minutes the IP has stopped cooking since it beeped (or how many minutes it has been naturally releasing pressure). No need to touch your IP while it naturally releases pressure. The pin at the top of your IP will drop when all pressure has been released and it's safe to open. Press SAUTE and add brown sugar and caramelized mushrooms and bring to simmer. Stir in cream (if using) and bring to boil. Stir in lemon juice, season with salt and pepper and serve.